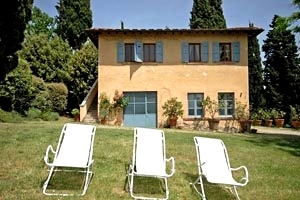 Villa sleeping 6 in the Chianti Classico area, a few kilometres from Castellina in Chianti (Siena). Air conditioning, swimming pool, Internet connection. 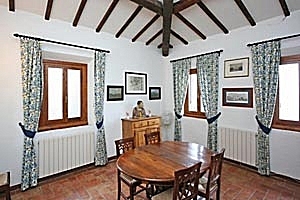 Possibility of organising dinners and wine tasting events to the property. 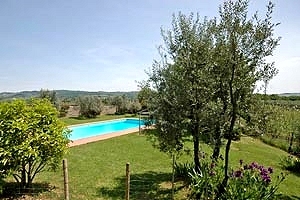 The villa is located in the heart of the Chianti Classic area, a few kilometres from Castellina in Chianti (Siena). 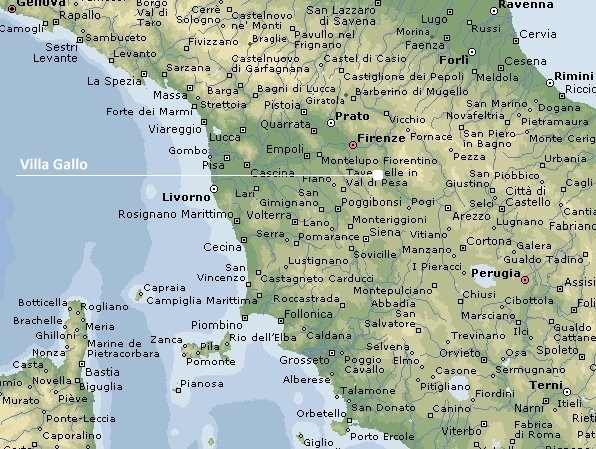 The Chianti Gallo Nero, the red wine renowned all over the world, is produced in this part of central Tuscany. Many wine growers offer the opportunity to taste their wines, as well as their extra-virgin olive oil, cheeses and cured meats. Sienese Chianti is also rich in ancient castles, including those of Brolio and Vertine. 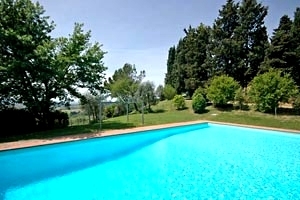 The villa is an excellent solution for those who want to visit the Chianti region, Siena, Florence, San Gimignano, Monteriggioni, Volterra and many other Tuscan cities of art, which are all within easy driving distance. 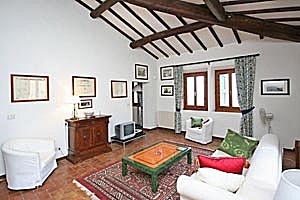 Situated at the centre of a large property that comprises olive groves and vineyards, the villa is surrounded by a wide garden furnished for having meals in the open air. 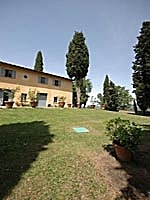 In origin, the villa was the outbuilding of the ancient manor house, where occasionally live the owners of the complex. The swimming pool (6x12 m; depth: 2 m) in the park is sometimes to be shared with them. 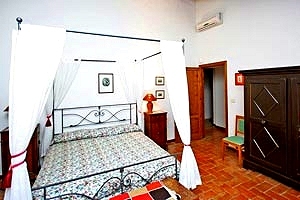 The beautiful rooms furnished in Tuscan style feature beamed ceilings and terracotta-tiled floors. The two-storey building with independent entrance can accommodate 6 guests in 2 double bedrooms and 1 double sofa bed, and has 3 bathrooms. 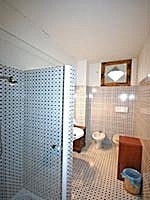 The ground floor composes of a large room with a table and a fireplace, and a bathroom with shower, washing machine and tumble dryer. 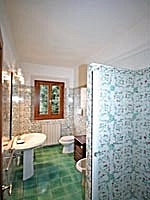 On the first floor (accessible only from the outside) are a large living room with double sofa bed, the dining room with kitchen corner, two double bedrooms and two bathrooms with shower. 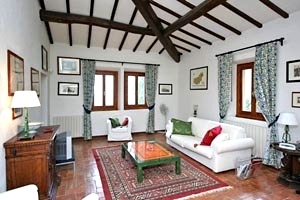 The villa comes with swimming pool, barbecue, fireplace, air conditioning, videorecorder, satellite TV, Internet connection, oven, toaster, microwave oven, dishwasher, washing machine, tumble dryer, cot bed and private car parking place. Guided tours of the farm with visit to the cellars and tasting experiences and dinners with Tuscan dishes are organised upon request. 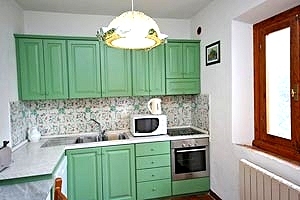 Negozi e servizi di ogni genere si trovano a 7 chilometri dalla villa.